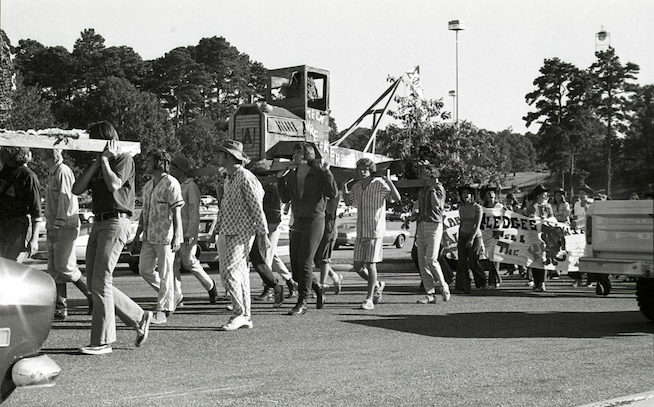 Wreck Tech parade, 1973. See great photos from the ’72 parade here. Yesterday, USA Today ranked that thing that happened before the 1896—”yes, 1896″—Auburn-Georgia Tech game as the 2nd best prank in college sports history. They gave it 69 words. Here are 449 more. So it was Auburn’s first home game against Georgia Tech… their first home game ever, actually, Nov. 7, 1896. The Tigers destroyed the Yellow Jackets in the shadow of Samford Tower to the killer tune of 45-0. However, there is a good chance the game was not decided, at least entirely, by Auburn’s superior grasp of Xs and Os but rather Tech’s curious lack of Zzzs. But yeah, Tech lugs their gear back to town keeping close to the tracks, stumbling and tripping on the cross ties, huffing and puffing and cussing. It must’ve been hell. That they played the game at all is kind of amazing. But young programs in those days were pretty desperate for their guarantee of the gate. Once Georgia Tech found out what happened, they were understandably pissed off, and refused to play Auburn the next year, only agreeing to resume the rivalry after API officials assured them of their efforts to curb such shenanigans with threat of expulsion. And thus began the Wreck Tech Pajama Parade, an annual (but sadly discontinued) commemoration and symbolic reenactment of the hi-jinks featuring a pajama-clad march to the Train Depot for a pep rally that in early years actually spawned activity even more criminal than the potential crashing of a passenger train. But more on that later. USA Today h/t: @SCS_AuburnFan. Photo: Larry Parker. Related: John Heisman’s 1899 letter to Auburn students. I miss playing GaTech ~ one of my favorite rivalries! For Auburn fans of a certain generation, like my dad, who grew up during the era when we played (and usually lost to) Tech in Atlanta every year, Georgia Tech was a much bigger rival than Alabama. The Wreck Tech pajama parade was a great tradition. It’s a shame the series was discontinued. We’ve lost a lot of good yearly rivalries over the years: GT, UF and Clemson. I think auburn at one time had more rivals than anybody in the country. Only ND might have more. Most fans today do not recall when football success in the state of Alabama meant beating the two Georgia schools, not each other. At Auburn, those games were so big they were celebrated beforehand with the Wreck Tech Parade (with freshman boys marching in pajamas to commemorate the track greasing) and the Burn The Bulldogs bonfire and pep rally. Even that other college in Tuscaloosa mentions only those two schools as rivals in their song, something about “go teach the Bulldogs to behave and send the Yellow Jackets to a watery grave.” How times have changed. The Wreck Tech Parade! So much fun. You haven’t lived until you got purple paint rubbed on you by a FIJI freshman or marched to the cadence “Wreck Tech, Wreck Tech, Wreck the Heck out of Georgia Tech!”.